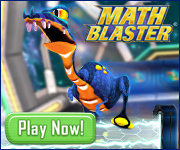 Greetings Blasters! Max here. GC and I love racing through our favorite intergalactic speedway, HyperBlast, but we never get very high scores. One day as I was shooting at a particularly rude robot, I saw GC further down using a bunch of tricks that I never even thought of before! That’s when I realized… Why don’t GC and I use some good old teamwork and share our HyperBlast secrets! Putting our heads together, we came up with 4 great tips so that you can reach HIGHER levels and get ASTRONOMICAL SCORES! Whenever I start a new game of HyperBlast, I put special thought into which topic I choose. 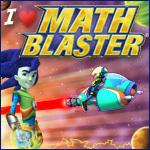 From addition to fractions, HyperBlast covers a lot of ground so it is important to choose a subject you feel comfortable with. Today, I woke up feeling GREAT about my division skills, so I selected that topic. Take it from me that you do NOT want to play too many games on the same topic. Since you want to get as many questions right when you’re blasting at the robots, you need to keep your brain as alert as possible! Destroying obstacles might be my favorite part of HyperBlast, but it’s also super important to getting a high score. I try to start shooting at obstacles as soon as I see them, that way I have a clear path to zoom through space and beat GC! A mistake I used to always make when playing Hyperblast was to forget to use my blasts. When you hit the control button, these blasts clear ALL the obstacles in front of you and you get points for it! How cool is that? You only get limited amounts of blasts so use them wisely. I try to only use these when I’m stuck in a crunch. Max always uses them right away, which makes it really easy for me to beat his score on harder levels. That’s why I typically win when we choose to race! Just used up my last blast, my health is low, and GC is already on the next level! How should I catch up? As GC mentioned, being able to answer as many math questions of possible can boost up your score. That’s why I train before each race by practicing my mental math skills so I can fire away at those evil robots. The topics will focus on specific groups of numbers, so you know exactly what to study before starting on your first level. Red alert! After defeating that angry green giant, I can see GC in the distance! Will I zip through these obstacles and get my highest score yet? Oh no! I hit an obstacle and lost my last life! I definitely plan to take GC’s advice and save my blasts for emergency situations. 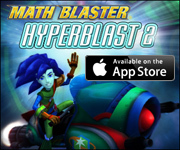 Now that you have advice from both GC and me, go play HyperBlast and try to beat our scores!